Currently, the list of tags in "ignored tags" and "interesting tags" has a little "remove tag" icon to the right of each tag. However, since this icon is not inside the div containing the tag, it can sometimes get wrapped onto the next line, which causes confusion as to which tag will actually be removed by the "×" icon. Which "×" do I click if I want to remove the ".net" tag? 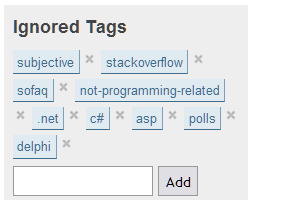 Which tag will be removed by clicking the "×" between "sofaq" and "not-programming-related"? At least add a confirmation to that thing. I click it by accident way to often. I prefer Joel's solution here to keep the 'x' outside the button and "just wrap them together in a span that's styled to not break." Do this. I can't figure out which X goes with which tag. At minimum I think there should be an &nbsp; between the tag and the 'x' so the 'x' doesn't get pushed over to the next line all by itself. and also added confirmation box on delete. Not the answer you're looking for? Browse other questions tagged feature-request status-completed tags user-interface . Can we get a little doohickey to undelete a tag from interesting tags? Can margins or padding be increased between tag name and “remove tag” icon in Favorite Tags?